Why should you cleanse your gemstones? Crystals, at their optimal, cleansed state, tend to have a high vibration. Negative energies, such as negative emotions or physical pain, tend to resonate at a lower frequency/vibration. The crystals will absorb this energy increasing your health and well being but this will mean the crystal will cease to have a high vibration and will become ineffective. Salt water: Certain crystals that are not water soluble can be left to soak in a container of sea water or water with cooking salt in it for anywhere between 1-24 hours. The crystal needs to be completely submerged for this method to be effective. Crystals can be left submerged for up to a week for a deeper cleanse. The gemstone should be rinsed off afterwards to remove any remaining salt. Do not reuse the left over salt water for future cleansing. Rocks that should not use this method are: porous stones, rocks containing metals, have a water content (etc opal), and soft stones such as talc. Dry salt: Half fill a bowl with either sea salt or cooking salt and place the crystals on top. You can also bury them for a deeper cleanse. They should be left here between 1-48 hours. The crystals should again be rinsed after cleansing to remove excess salt. 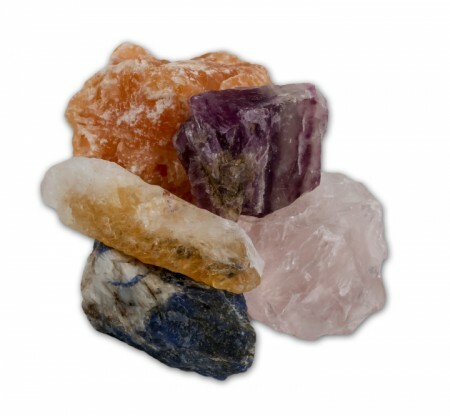 Other crystals: This requires placing your crystals on top of a cluster of any variety of quartz. The cluster must be cleansed regularly as well for this to be an effective method. You can leave them there for a few hours to a few days. This is particularly effective for jewellery and pendulums. Smudging: This involves burning smudge sticks or incense and holding the crystals in the smoke. Smudge sticks are preferable but incense will work too. The most effective smudge sticks include: Sage, Sweetgrass, Sandalwood, and Cedarwood. This does not have to take long – 30 seconds to 1 minute will do. Visualization or good intentions: Placing the stones in front of you, focus on visualizing the negative energies leaving the crystals. Another visualization method is imagining a bright white light going all the way through the stone, removing any negative energy. Sunlight and moonlight: This method requires the gemstones to be placed in a place where they will be fully exposed to either sunlight or moonlight. This can take 2-24 hours. The longer the exposure, the deeper the cleanse. Certain stones such as amethyst and aquamarine will fade when subjected to prolonged periods of time in the sun. It is not recommended to use this method when the weather is very hot because the crystals may crack due to heat stress from the sunlight. Burying in the Earth: You can do this by either burying them directly into the earth, or by wrapping them in a natural cloth such as: cotton, wool, or silk, and then burying the bundle. It is recommended that the soil be free from chemicals and pesticides. If your crystals are water soluble, try to make sure that they are not buried when it is going to rain. Running water: Placing the crystals in a container, let clean, unpolluted water from either a creek or stream run over them for preferably 1-2 hours. Tap water is not recommended because it is full of chemicals. Rice: Place the stones on top of a bowl of rice and leave overnight. You can use any type of rice. Flower water: Place the crystal in a bowl of water containing flower petals, (rose, jasmine, and honey suckle are popular), for 24 hours. Sound: This involves having the crystals near a crystal or Tibetan singing bowl while you play it.